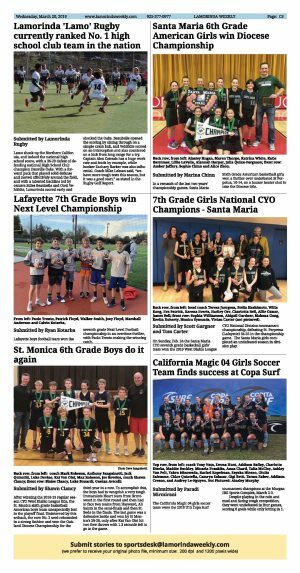 After winning the 2018-19 regular season CYO West Diablo League title, the St. Monica sixth grade basketball American boys team unexpectedly lost in the playoff final. Undeterred by this setback, the now No. 2 seed rebounded in a strong fashion and won the Oakland Diocese Championship for the third year in a row. To accomplish this, the boys had to vanquish a very tough Immaculate Heart team from Brentwood in the first round and then had to face two teams from Hayward, All Saints in the semi-finals and then St. Bede in the finals. 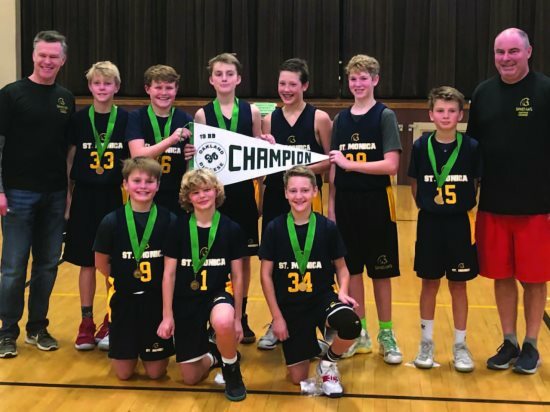 The last game was a defensive battle and won by St Monica's 28-26, only after Kai Van Olst hit two free throws with 1.3 seconds left to go in the game.